PHUKET: -- A rear-end collision spun a car out of control on Thepkrasattri Road in Koh Kaew yesterday morning, causing the car to slam into a motorbike, killing the rider. 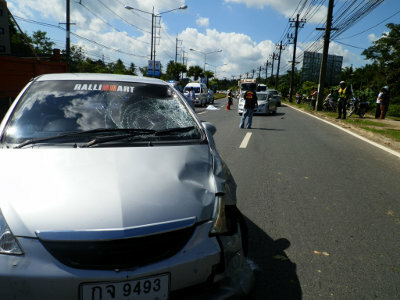 Thalang Police duty officer Patiwat Yodkwan was notified of the accident at 9:15am. At the scene, about 300 meters south of the Tah Reua Temple, Capt Patiwat, fellow police officers and Kusoldharm Foundation rescue workers found 21-year-old local resident Amanee Dor-ngor lying dead on the road, apparently from a head injury. “Ms Amanee’s relatives told us she worked at a local laundry. She had just picked up some laundry from the Yee Teng house, which she normally did as part of her job,” said Capt Patiwat. 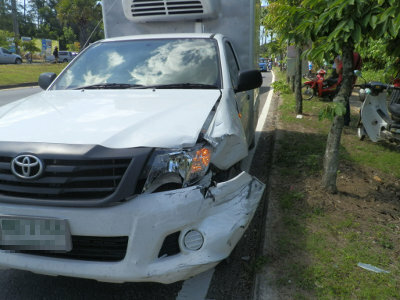 Anirut Ubonkaew, 33, told police he was driving his Honda City car northbound from Phuket Town to the airport when his car was struck hard from behind by a pickup truck with a converted refrigerator unit on the back. “He said the truck slammed hard into the back of his car, causing him to lose control of his vehicle, and he hit Ms Amanee’s motorbike,” Capt Patiwat told the Phuket Gazette. All three vehicles were at the scene when police arrived, together causing a long tailback on the busy road. “Both drivers have been taken to Thalang Police Station for further questioning,” Capt Patiwat added. Maybe because you're not used to driving on the left hand side of the road and overtaking on the right? Impact on the left hand side of the vehicle and trying to overtake on the left? Sounds strange to me. he was in the service lane on the left and probably turned sharply right to avoid something then turned back left to avoid traffic and slammed with the left side. 150meters later it turned from the small street onto an other busy street with an accord coming in fast and again just turned with no regards and the accord had to hit the breaks. He also ran over some very high speedbumps really fast even though he had cars in front of him so no reason to drive fast. Just an other careless killer back on the road again.